I started on a new project with Nathan back in March. It's now far enough along to share with the Homebrew forum. Or by hitting the occasionally exposed Energy Field. Be careful of asteroids and mines. Also beware of the enemy ships. They currently just fly around in formation and cannot yet be destroyed, but running into them is still deadly. For this project I came up with a slick new kernel that gives me the ability to reposition an object (player[also known as sprite], missile or ball) on every single scanline. 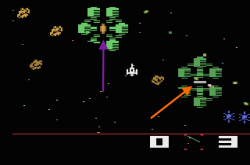 In Space Rocks I was limited to only repositioning the players, and only every-other scanline at that. Check out my Draconian Blog Entries if you're interested in learning more about this. Level = select from 1 of 6 test levels. TV Type = Select NTSC, PAL or SECAM for proper colors based on your model 2600. If you're checking this out with Stella, be sure to turn on phosphor mode! NOTE: this is an early version of Draconian. Use the link at top of this post to get to the reply with the latest version. Edited by SpiceWare, Thu Nov 16, 2017 2:30 PM. I haven't tried the game out yet but I'm loving the title screen. 32K?!! 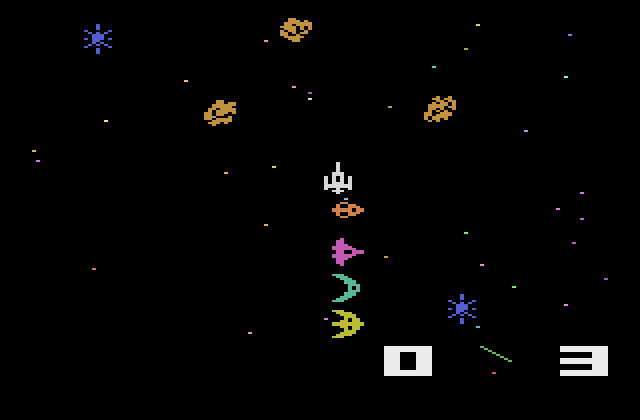 Sorry, but I only play 4K games to be true to the original Atari. I cannot be corrupted! The first time I played the arcade game that had another name was at a pizza place with a group from high school. It was the cocktail version, so I had to sit down and play. It was weird sitting and looking down to play an arcade game. I bet this game will be one of the biggest sellers once it gets in the AtariAge store. Hey this looks great! I know it is a Bosconian (sp?) clone, but did you get the idea for Draconian from the TRS-80 game? This game is incredible! 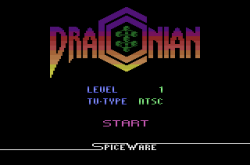 I loved playing Draconian on the CoCo and Dragon back in the day and this port is even better. Awesome! While I'd planned to get a CoCo as my first computer, a Radio Shack clerk lied to me so I ended up getting a Vic 20 instead. As such, I wasn't familiar with the CoCo game. 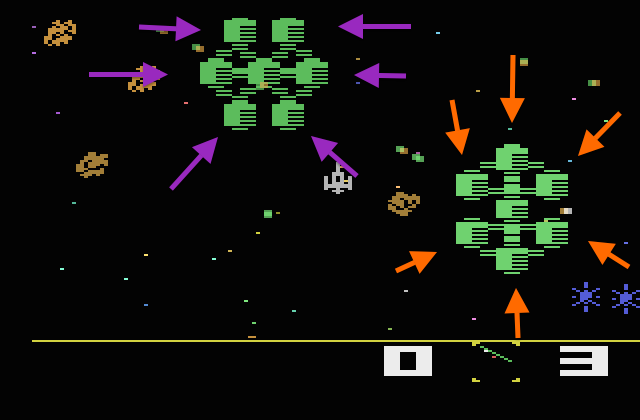 The idea came from Nathan's blog entry containing ideas on how to port the original arcade game to the 2600. The arcade game's from 1981 while the CoCo game is from 1984. We start working on it via PM then posted the initial build announcing the project 8 years after Nathan's blog entry was posted. The name was a coincidence. Since I've always renamed my versions of arcade games I wanted to do the same for this. We came up with a dozen names, including Atarian, Space Fortress Attack, Stellar Assault and Space Infiltrator. A couple days after we decided on Draconian Nathan discovered AtariLeaf's video about the CoCo game. We debated changing the name, but decided not to. 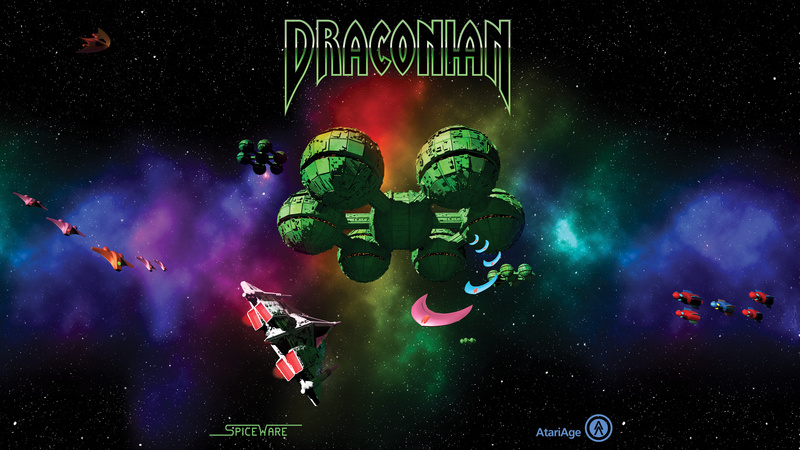 If you're interested there's a lot of other info about the development of Draconian, including discussion about the CoCo game, in my Draconian blog entries. As with my other projects the blog will see more frequent updates, and contain a lot more technical detail, than updates in this topic. This looks really nice. The little parallax thing you have going on with the stars really does something for the feel/gameplay. It looks more like something you'd see on the XL/XE/5200's, like Zone Ranger. Love the original, was just playing it a few weeks ago at The Arcade in Brighton, MI. This port looks fantastic, great job! ... I couldn't help myself. This is one game that I wish had been done in the early days of the VCS. 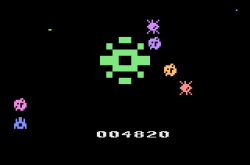 Loved Bosconian back in 81' and this is a perfect version for the Atari! GREATJOB!!!! This is one game that I wish had been done in the early days of the VCS. At that time we didn't have the (affordable) technology we have now. High school freshman year was 80/81. That's when I was introduced to computers and started to learn BASIC by reading the manual after school (the computer classes were only for upperclassmen). I got my VIC 20 for Xmas of 81 and probably started to learn machine language in 82. I did so by reading the chapter in the VIC 20 Programmers Reference Guide. I used machine language to speed up games that were too slow with 100% BASIC. 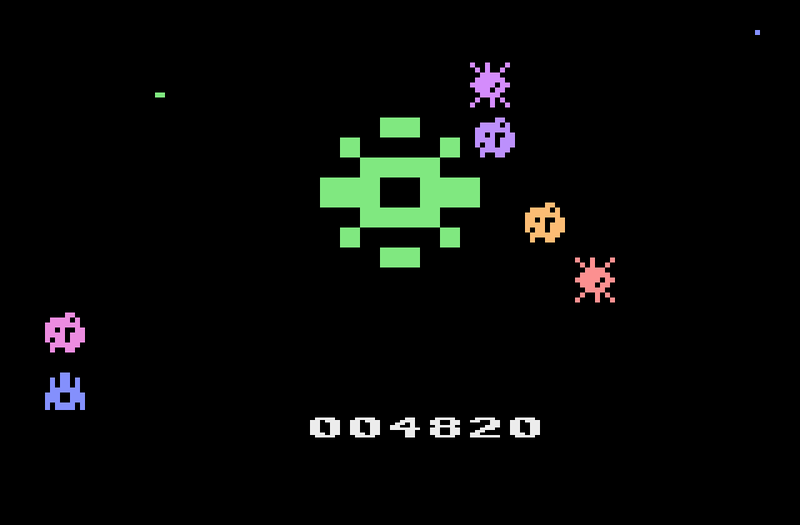 An example of that would be a Super Cobra type game that was written in BASIC, but used a machine language subroutine to scroll the screen to the left. I finally wrapped my head around negative numbers after I got an assembler and could see what it generated for backward branches. Edited by SpiceWare, Tue May 6, 2014 8:52 AM. Oh, I don't know about that. 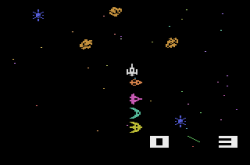 Darrell's games are (not only) technically quite different beasts compared to other 2600 games. Almost all code besides the display kernel is directly executed on Harmony's/Melody's modern ARM CPU. Which is way more powerful than the Atari 2600 CPU. And the display kernel is turbo charged too by the ARM CPU. It is providing all data much faster than the Atari CPU can do. So effectively you have an ARM game which uses the Atari 2600 for displaying graphics, playing sounds etc. Somehow I haven't been there yet... thanks for the random name drop! Looks like a quick hop from Lansing. This is true, but Draconian is awesome! Agree gamers should be aware of the difference and not to expect classic hardware games to match what is possible with the ARM. That would be nice. I also keep hoping that someone will figure out how to give us 39 more variables to use with the DPC+ bB kernel. RevEng recently found a way to give us 9 more variables. All we need are 39 more variables to match what we get with Superchip RAM (26 + 48 = 74). The DPC+ bB kernel with 74 variables would allow me to create just about any game I've ever wanted to make. One thing: And this is probably a screen issue: Is it possible to move at the same speed for all directions? It's possible. Code was in place at one point that compensated for the 2600's non-square pixels. I promptly removed it due to how crappy it turned out. All the stationary objects(asteroids, mines, stations) get a bad case of judder due to how object flicker and fractional movement clash with each other. You can see it for yourself, along with more detail about the problem, in this blog entry. Start with the text just below the monochrome menu screenshot and download the "judder" version of the ROM. Edited by SpiceWare, Tue May 6, 2014 6:34 PM. While I won't be doing it, I have no problem with somebody else taking my routines and incorporating them into bB. Main reason is I'm not familiar with the innards of bB, and I don't wish to learn it as I already have too many other projects going on. Edited by SpiceWare, Wed May 7, 2014 9:58 AM. Heck, I'd rather someone figure out how to write the kernel %99 in ARM and just use the 2600 to draw the framebuffer and get input. It would be pretty cool though! You added a nice sound effects engine for bB; maybe you could provide some hooks that don't have to integrate directly with the kernel.